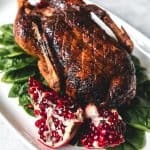 This Honey Roast Duck recipe makes a beautiful holiday main dish but is easy enough for any special occasion or Sunday dinner. With crispy skin and tender, juicy meat, this post will show you how to cook duck to get that beautiful roasted look and amazing flavor! Completely defrost the duck in the refrigerator for 2-3 days if using a frozen duck, then remove giblets and neck. Rinse well, inside and out, with cold water and pat completely dry using paper towels. Let the duck sit out on the counter for 30 minutes to come up in temperature a bit. Use a sharp knife to score the skin on the duck's breast in a diamond pattern, trying to cut only the skin without reaching the breast meat below. If there are other fatty areas like where the duck legs connect to the body, give those a poke or slash as well. Stuff the cavity of the duck with garlic cloves, a quartered onion, and a couple sprigs of rosemary. You could also use lemon slices or a quartered apple. Fold the loose skin on both ends of the duck to hold everything inside and tie the duck legs with butcher's twine or string to truss it by tying a loop around one duck leg, then crossing it over the other leg and wrapping the twine around both legs a time or two, then tying it off. In a small bowl, combine the salt, paprika, garlic powder, and pepper, then rub over all over the duck. Place the duck with the scored breast side up on a wire cooling rack over a baking sheet or on the rack of a large roasting pan. Start the duck by roasting it at a higher temperature of 425 degrees for 15 minutes, then decrease the oven temp to 350 degrees and roast for 1 hour and 15 minutes. At the 60 minute mark, brush half of the honey over the duck, then cook for 10 minutes before brushing the duck with the remaining honey. If the juices are still running pink after a total of 1 1/2 hours, let it roast another 15 minutes before pulling it out of the oven and tenting with foil for 15 minutes to let the juices redistribute before carving. The duck will be done with the juice running from the thigh after poking it are just barely a rosy pink color.